The domain holdings include some wonderful old vine parcels and this climat was planted in 1946 and bore very little fruit in 2016 (not more than 8 hectoliters per hectare, which is tiny). The flavours here are beautiful spring floral notes that mix well with the green apple and greengage fruit. There is ripeness here and a lovely sweetness which is well-matched by the tell-tale acidity which is always very present in the Chérisey wines. The wine finishes with great elegance and length. Perched high up in the hamlet of Blagny, this premier cru which straddles the appellations of Meursault and Puligny may become known as one of the top terroirs for white wines thanks to global warming. The 2016 is a case in point. The altitude and the east facing slopes serve to offset the effects of drought and heat. This is a lovely Puligny with great structure and freshness offsetting the beauty of the Chardonnay fruit. 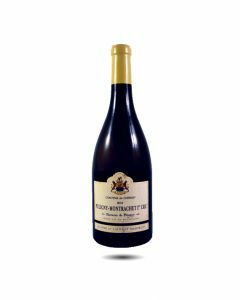 On the finish there is a vibrant, fruit and mineral taste that leads to an elegant finale. Verkoop beperkt tot 2 flessen per klant.